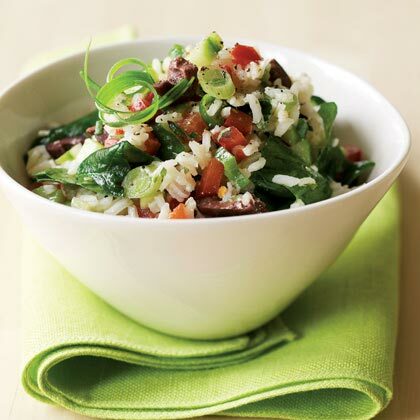 The bright flavors of this Mediterranean Rice Salad make it the perfect side dish for anything grilled. In a medium saucepan, bring 2 1/2 cups water to a boil. Add 1/2 tsp. salt and the rice. Turn heat to low, cover, and simmer 15 minutes. Remove from heat and let sit 5 minutes. Uncover and fluff with a fork. In a large bowl, whisk lemon juice, olive oil, garlic, oregano, pepper, pepper flakes, and remaining tsp. salt. Add rice to dressing and toss to combine. Add spinach, toss, and let sit until no longer steaming, about 20 minutes. Add remaining ingredients and toss to combine. Serve at room temperature or cold.